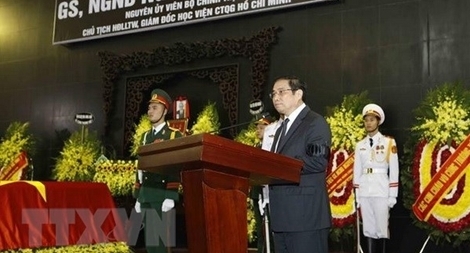 A respect-paying ceremony for former Politburo member Nguyen Duc Binh, who was also former head of the Central Theoretical Council and former Director of the Ho Chi Minh National Academy of Politics, was held on February 3 at his birthplace in Hong Linh town, the central province of Ha Tinh. PSNews - The Standing Board of the Central Party Committee of Public Security on January 14 held a conference to announce the report of Inspection Delegation No. 713 of the Politburo on the implementation of the Party Central Committee’s Resolution No.04 (Term 12th) on strengthening Party building and Directive No.5 of the Politburo on enhancing the movement "Learning and following Ho Chi Minh's thoughts, morality and lifestyle." The Political Bureau of the Party Central Committee on July 12 issued a warning as a disciplinary measure against Truong Minh Tuan, member of the Party Central Committee, Secretary of the Party Committee of the Ministry of Information and Communications (MIC) and MIC Minister. PSNews – The Ha Nam Provincial Police on June 5 reviewed 2 years implementing Directive No.5 of the Politburo on promoting the movement “Studying and Following President Ho Chi Minh's Thought, Morals and Style”, and 5 years implementing Directive No.5 by the Ministry of Public Security (MPS) “Promoting the movement of the People’s Public Security Forces studying and following 6 teachings of Uncle Ho”. Politburo member Truong Thi Mai, head of the Communist Party of Vietnam (CPV) Central Committee’s Commission for Mass Mobilisation, has requested raising responsibility of Party committees and authorities for exercising the regulations on democracy at grassroots level. PSNews – Lieutenant General Nguyen Van Son, Deputy Minister of Public Security led a delegation to work at the Xuan Phuoc prison and the Phu Yen Provincial Police. The Politburo has issued a resolution on developing tourism into a spearhead economic sector by 2020, contributing 10% to the country’s gross domestic product (GDP), up from the current 6.8%. Chief of the Party Central Committee’s Office Nguyen Van Nen visited some former leaders of Laos on November 25, conveying to them best wishes from Party General Secretary Nguyen Phu Trong. Hanoi - Renewing management mechanisms and reducing the number of employees on the State payroll are needed to replace incompetent civil servants with qualified ones, said Deputy Minister of Home Affairs Tran Anh Tuan. On September 15, Members of the Politburo, leading by General Secretary Nguyen Phu Trong, held a working session with the Standing Board of the Can Tho city Party Committee on realizing socio-economic development tasks.